Wimberley Valley Saori is a registered Saori weaving studio and an authorized distributor of Saori looms, yarn, and weaving supplies. It is a destination for those looking to become part of a creative community, as well as a showcase for Saori-inspired hand-woven garments and accessories designed and created by owner Kathy Utts. The studio is located inside a gated private residence and is generally open for visitors and students on Thursdays 10 am to 4:30 pm, and by appointment the rest of the week. If you are interested in visiting the studio, please contact us. As a girl, fashioning “distinctive apparel” for dolls and dogs eventually led to sewing my own clothes. I loved to sew! This interest led me to pursue a degree in home economics education, with a special interest in clothing construction and fashion design. 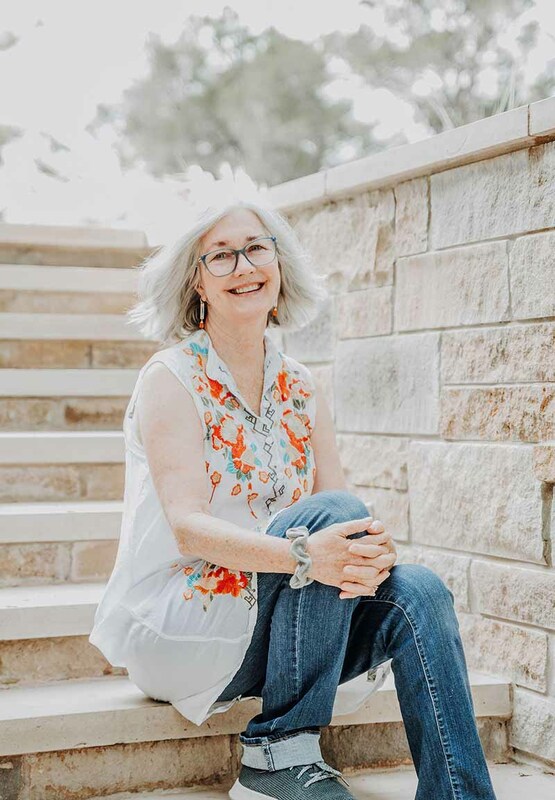 My husband and I moved to Wimberley, Texas when our children were young, and I began a love affair with nature, beautiful sunsets, organic gardening, and our 15 fluffy alpaca. These amazing creatures were my initial inspiration for opening a yarn shop in downtown Wimberley in 2013 (Ply! Yarn). Four years later I sold the yarn shop to focus more on weaving, and I’m once again pursuing my dream of designing wearable art! 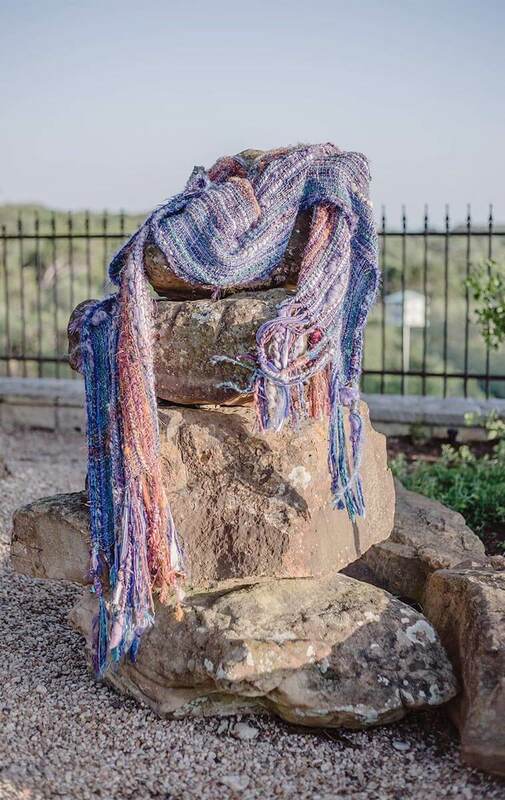 Wimberley Valley Saori is a manifestation of my fiber arts journey so far. There have been many amazing teachers and artists who have influenced me along the way, but what has remained constant is my affinity for anything “free style” regarding fiber arts. When I discovered Saori weaving five years ago, I knew I had found the right medium for my artistic voice. Saori weaving, defined most simply, is free-form uninhibited weaving. But it is so much more than that! 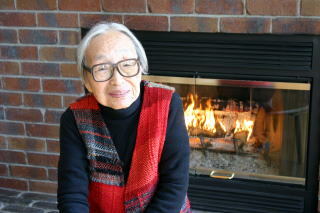 Founder Misao Jo was 57 when she decided she’d like to learn to weave. That was inspiring in itself, because so often we limit ourselves by thinking “it’s too late” to start a new career or pursue a new interest. In SAORI: Self Innovation Through Free Weaving Misao describes both her evolution as a weaver and the philosophy she developed that sets Saori apart from conventional weaving. In Saori we break with “conventional, patterned thinking which values uniformity” and perfection, and strive instead to let the creative expression of our true selves shine and guide our work. Misao felt that we shouldn’t aspire to create like machines, but rather, celebrate our humanness in its perfect imperfection. At Wimberley Valley Saori, we aspire to express this free-spirited weaving with color, texture and irregularity in our woven cloth. To learn more about Saori and Misao Jo, please visit the official Saori website at saorinomori.com. filled with beauty, design, freedom, and originality.